Thousands of different kinds of ants live in various regions of the United States. While some, such as fire ants and carpenter ants, are notable and notorious as major pests, most ants are either harmless or are actually important beneficial insect allies. 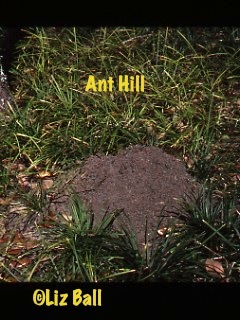 These ordinary "backyard ants" are inconspicuous most of the time as they go about their business in the soil. It is when they swarm in the spring that homeowners become aware of ordinary ants. The roiling patches of tiny bodies spread over the sidewalk or on patios and walls, suggest that a major invasion is underway and that some sort of action should be taken. At this time it is important to distinguish between harmful pests such as fire ants, carpenter ants and termites and the ordinary ants that are a natural and helpful part of your backyard ecosystem.